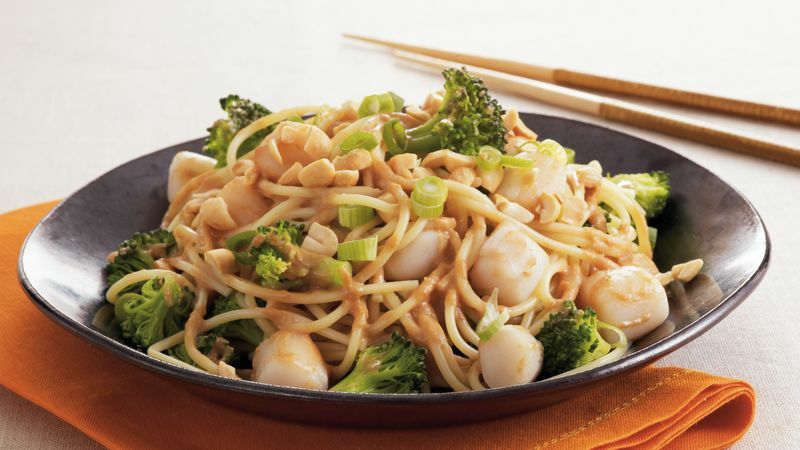 Cook spaghetti as directed on package—except add broccoli and scallops during last 4 minutes of cooking. Scallops are done when they turn white and opaque. Meanwhile, in small bowl, beat peanut butter, soy sauce, vinegar and red pepper sauce with wire whisk until smooth. Drain spaghetti mixture; return to saucepan. Add peanut butter mixture; toss gently to coat. Sprinkle with peanuts. Serve immediately. Scallops are a source of magnesium, which helps send signals to the muscles via the nervous system.